Ronnie Shalvis the the mind behind some of the most recognizable parkour videos on youtube sent us an article outlining his steps to overcome fear in Parkour and life. It’s definitely worth a read! A question I often get asked, is how to overcome fear. Whether it’s a fear of heights, a fear of flipping or even just trying something new. I’m going to explain how we can come to understand our fears, and the steps you can take to help you conquer your own fears. Now I’m not any form of psychologist or scholar of knowledge when it comes to the science of fear, but I know fear very well through experience. I’m sure fears are different for everyone but my thoughts on fear are based primarily upon the experiences I have had and what I have learned in dealing with fear and overcoming it. In my experience fears are different from person to person, but they can all relate to what causes fear. I grew up with a fear heights, a fear of being under water, a fear of being in tight spaces, fear of spiders and a fear of flipping upside down. Kind of strange based on what I do for a living, good thing these fears don’t effect me nearly as much as they used too. So where did these fears come from? Well I could fall off of something high and get injured or die, I could drown under water, I could get stuck in a tight place, get bit by a spider and I could land on my head doing a flip. All of them were fears because of the reality that there is potential danger in them. The first thing I want you to understand about fear is that fear isn’t bad, it’s a defense mechanism our mind uses to help us recognize potential dangers and prevent anything serious from happening to us. So fear is an important tool to help keep us safe, but at what cost? If we lived our entire lives based around fear, well then we would never leave the house because anything could happen. So although fear is important if we give fear too much power, then our life becomes meaningless. Life is all about taking calculated risks to progress and gain experience. Every time you get into a car you are taking a calculated risk that you could get in a car accident, but the risk is small enough that it is worth it to you because of how much more you can get done with the convenience and speed of a car. So if there is risk in dying just from driving a car on the road, why aren’t there more people afraid of driving in cars? The second thing I want you to understand about fear is it doesn’t actually exist. It’s not any form of substance nor is it tangible, it’s simply the neuron connections in the brain processing things a certain way to cause us to avoid or run away from things. In more simple terms it’s your imagination. Fear doesn’t guarantee anything, if you have a fear of heights because of the chance of falling off, it is only a chance. Fear doesn’t ever mean something will actually happen. Because of the nature of fear, overcoming fear requires a disciplined mind, the ability to let go of your imaginations, just “let it go”. (Does that phrase bring a song to anyone’s attention?) Because reality is: If you know you can do something but you still have fear stopping you from doing it, then your fear is only there because your imagination is creating an idea of something that doesn’t actually exist. 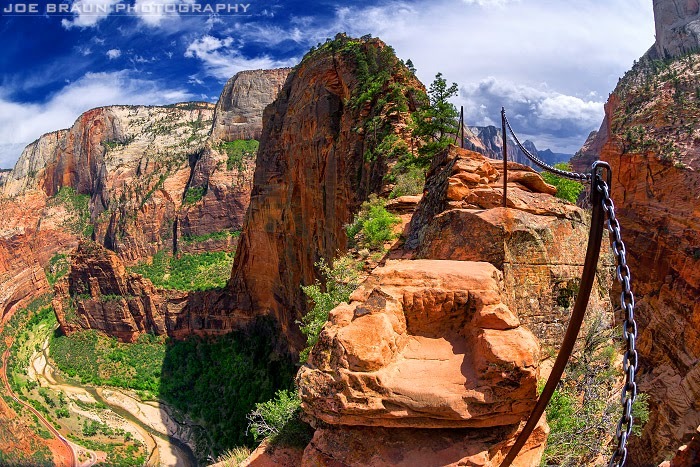 When I was young my family went to Zions National Park where I had the opportunity to hike a cliff called Angels Landing. To get to the peak we had to climb up these steep boulders while holding on to chains that were bolted into the stone for safety. Once at the top it was like a rounding narrow plateau with sheer 1,000 foot drops on either side. It appears an angel in a plane might have just enough room to land there. Even with my fear of heights, I wanted to get to the top of this cliff as an accomplishment. Making it to the top was a spectacular view. The perspective of this natural environment delivered beauty and awe. I was nervous to go towards the edge, but I decided I wanted to see more and feel more so I walked closer and closer to the edge until finally I was able to look straight down. Immediately I was filled with a feeling of power and majesty, something I can’t explain fully but one that made me feel greater then I thought I once was. In that moment a fleeting thought penetrated my mind: ‘ fears are what keep me from powerful experiences like this one. I could be missing out on many more because of them.’ It was because of that thought I was inspired to make the choice that I wanted to conquer all of my fears. Over the years, one by one I started conquering my fears. It’s not like I had to, but I didn’t ever want to feel limited because of my fears. Before I even got into parkour I was climbing tall structures and mountains to become familiar and comfortable with the height. I knew as long I was only doing things within my limits there was no need to be afraid of heights. One method that helped me with heights was to look at things the way they are. Often people afraid of heights get vertigo when looking down on something very high, I had the realization that there is no difference between looking down at the ground from a 50 ft drop and looking at something 50 feet in front of me. If I look at building 50 ft directly in front of me I don’t have the fear that I am going to smash into that building, but it’s the visually the same thing as when I look down a 50 foot drop. So on top of a building when I look down, I don’t see a distance I could fall from, I envision that the ground is simply a wall just 50 feet away from me. 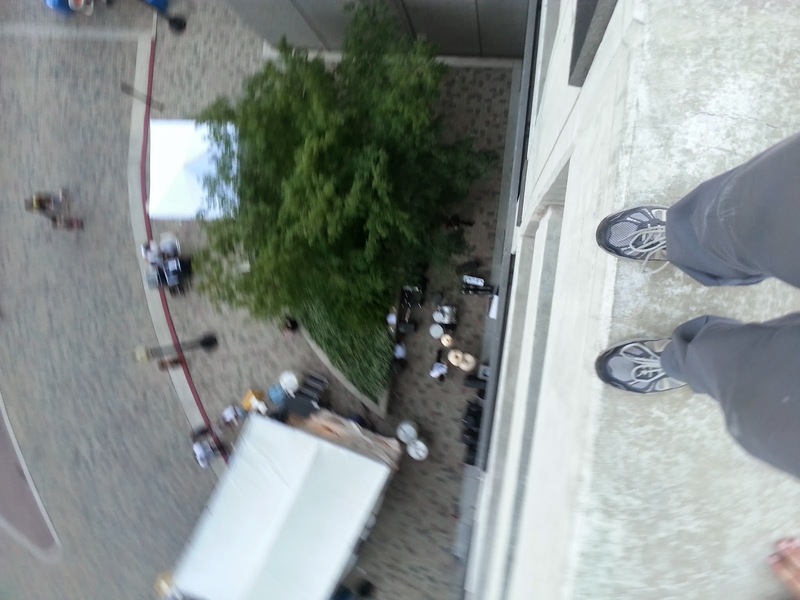 With that adjustment of perspective my fear of heights was completely gone. But keep in mind I still maintain a little bit of fear of falling from height, and that’s what keeps me from doing things that are outside of my ability when on tall structures, but it’s not enough to prevent me from exploring what I am capable of at height. Ukranian free runner hangs from some insane heights. I wouldn’t encourage anyone to do this, but I use him as an example as he has completely dominated fear. Although many see him as crazy I’m confident that he knows what he is doing and knows exactly what he is capable of. He trusts his arms to hold him, the same way a sky diver trusts his parachute to catch him before hitting the ground. Again for each of my other fears I began looking for experiences to overcome them. I spent more time under water holding my breath knowing I could just rise to the surface if anything went wrong. I started exploring caves that normally would have made me claustrophobic. 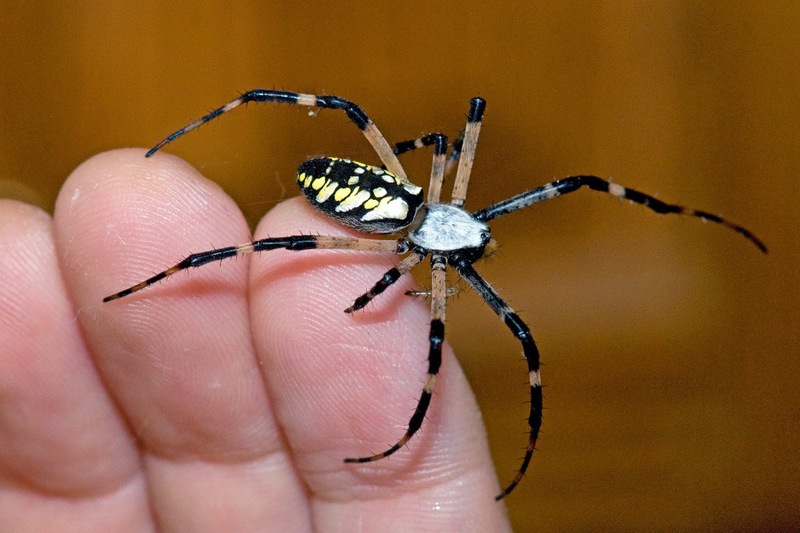 Spiders I knew weren’t deadly I would let crawl on my hand, because I knew if it did bite me the effect would only be similar to that of a mosquito bite. They never did bite me. With my fear of flipping upside down I just started practicing flips on a trampoline and took steps to get more comfortable with that feeling through practice. Like with anything, learning to overcome fear takes practice. Start with small things that push your comfort zone a little bit until you feel comfortable with it, then slowly push yourself more and more. Eventually as you practice overcoming fears, even if they are small fears you will become better at overcoming fears. You have to practice letting go of your imaginations and see everything as it is by understanding the actual risk involved and deciding if it is worth it? Consider this as an example: Statistically if you drive 2000 miles in a car you are more likely to die then one jump out of an airplane parachuting, and consider how many thousands of miles we drive every year. Let knowledge of the situation be what helps you decide what to do, not fear. It takes practice, time and meditation but if you work at it you will be able to conquer any fear you face. For a better understanding of risk, feel free to watch this video where Michael from Vsauce (one of my favorite youtube channels) talks about the types of risk we experience in day to day life. Whether it’s learning a trick or trying something new here are steps you can take to help you overcome your fear. Keep in mind you may not need all of these steps in your situation, but they all have helped me in different ways. Ask yourself why you want to do this? what will you be missing out on if you don’t? Is the amount of risk involved worth the desired outcome? This kind of goes along with step one, but determine the risk involved, and find ways to create the environment to be as safe as possible and minimize that risk. For example: If learning a new trick, Is there a gymnastics gym available to learn this trick safely into a foam pit? Or is there a friend who can help spot you? This will help dampen your fears. Is there any way you can look at the situation in a different light for it to seem more normal like a day to day activity? Is it the fear of going upside down in a flip? If you can already do handstands you have already done something where you go upside down. Use that same feeling of something you are comfortable with and apply it to this next trick you are about to learn. Envision yourself going through the motions over and over again, don’t ever let the thought of messing up or falling slip into your mind. It has been proven that thinking about performance and meditating on it is a powerful way for athletes to perform better and more successfully. Accept the fact that you might fall and be ok with it. Sometimes before I learn a new trick I will fall on purpose, to realize that falling isn’t as bad as I thought. Even pain is relative, someone who experiences pain more often is going to be less traumatized by it when it happens and suddenly the fear of pain isn’t the issue anymore. Personally for me if the only risk involved doing a trick is getting scrapes or bruises, then I have no worries because those types of injuries don’t bother me especially because they don’t cause any long term damage. If none of these previous steps helped you overcome your fear, then maybe you just need to practice with smaller things first. These are basic steps that can be adjusted and experimented with to help you overcome fear. I’ve found different steps work better with different types of fears, so figure out what causes your fears and mental blocks and practice different ways of overcoming them. Now choose the fears you want to overcome, so that you can gain the experiences and accomplishments you may be missing out on. Also remember to be safe. Overcoming fear isn’t about being crazy or reckless, it’s about calculating and being in control of your mind and body. Ronnie have spent the last 8 years training in the disciplines of parkour and free running. One of his most famous video is Zombie Parkour. Check out his blog here.